Download Emmy Awards 2018 1080P HD MP4 full show, winners/nominees TV shows to computer and devices for enjoying whenever wherever. 70th Emmy Awards was held on September 17, 2018 at the Microsoft Theater in Downtown Los Angeles, California to celebrate best TV programs from June 1, 2017 to May 31, 2018. Full show of this grand annual television academy was broadcasted by CBS. Unlike TV followers who are available to watch Emmy Awards 2018 ceremony live on time, some people probably miss TV broadcast for work, important meeting etc. or on a trip. It's a good idea to free download Emmy Awards 2018 full show video or winners/nominees TV shows to computer or devices (iPhone, iPad, Android) for enjoying whenever wherever without any interruptions. And, video downloader software can help you achieve this task. Let's Free Download Emmy Awards (2018) Full Show Video/TV Shows Right Now! Free Download Emmy Awards (2018) full show video, winner/nominated TV shows and other film/music awards videos to 1080P/720P HD MP4 at a super fast speed. It can also help free download 8K/4K/HD/SD/3D/VR movies, music videos, sports etc. from 300+ sites within a few clicks. Thousands of Emmy Awards videos (including red carpet, official or fan-making of full show ceremony, winner/nominees TV shows etc.) are uploaded to YouTube and the likes allowing viewer to watch online for free but not available for download. WinX YouTube Downloader, a reliable online video downloader, offers the best solution to free download Emmy Awards 2018 full show video, TV series with all episodes, and other related videos escaping from various problems during watching online, for example, long-time loading, intermittent playback and audio issue. It can get 1080P/720P HD, SD or even 4K, 8K, 3D, VR videos to MP4, WebM, FLV, 3GP off 300+ sites depending on source qualities. The built-in Multi-thread and Multicast Tech bring a super fast (5-8x real-time) download speed. In addition, it is a 100% safe program bundled no adware, spyware, virus or other malicious stuff. Download and install WinX YouTube Downloader on your PC (supporting Windows 10 and the lower). Next, follow the guide to free download Emmy Awards 2018 full show or other videos. Step 1. Launch WinX YouTube Downloader and hit the link-shaped button on navigation bar. Open YouTube or any supported video sites and input Emmy Awards 2018 or the title of winner/nominated TV show (like Games of Thrones) into search box to get the video you want to download. Open the video. Copy and paste its URL to address bar of pop-up window. Step 2. Hit Analyze button to load video info (title, duration, version varying from resolution, format, size and code). Select one version (1920x1080 MP4) and click OK. Step 3. Click Browse button to set target folder if necessary. Last, hit Download button to start Emmy Awards 2018 1080P HD full show video free download process. After the download are finished, you can transfer the video to iPhone iPad for a movable enjoyment via WinX MediaTrans, which can automatically rotate video from vertical to horizontal for full-screen video playback after transferring. Need to download and convert Emmy Awards (2018) videos for further editing and sharing? Try WinX HD Video Converter Deluxe – the upgrade version of WinX YouTube Downloader. 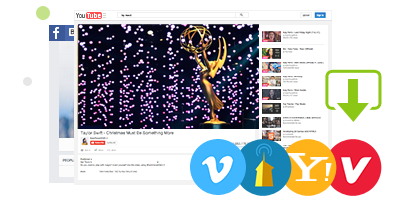 • Free download Emmy Awards (2018) videos and other ceremonies, film festival, music awards as well as all kinds of TV shows, movies, music videos, sports etc, from 300+ sites with ease. • Convert/compress online and local videos to MP4, AVI, WMV, MOV, FLV etc. for editing via Windows Movie Maker, iMovie or sharing on SNS services. • Crop, trim and add subtitles for videos. Adjust video/audio parameters, aspect ratio, resolution, frame rate, bit rate and more.